Infamous street artist Krink will take on photographer Yone in a battle of art skills at And A in Japan. The collaboration features collaborative artwork exhibition and original limited-edition items at And A shops. The opening party will be on August 25, 2010 at the And A shop in Shibuya, Tokyo. 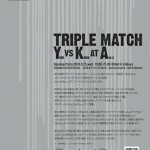 The exhibition will be on display from August 26, 2010 until September 17, 2010 at And A, And A Accessoire, and And A Homme shops throughout Japan.